Discussion in 'Tennessee Flyway Forum' started by rtjrex & MollyAnn, Mar 5, 2019. Naw, we lock up the gate that comes up to the post so's we dont loose the gate.. surely there aint none of them' so-called heads around there. No Women allowed in Plantation Bottoms', period! well, except for ThorneSide Cabin and THATS not the Bottoms'.............period! Thats the rules! Does this ever happen to anyone else besides me?? There I was sitting in the rocker on the cabin porch enjoying a libation of Crown with Maggs right beside me. SxS would call her a true "Gentlemen's Dog". I would say that she is a dog that LOVES Crown on Ice and is waiting on Ice cubes to be pitched her way as usually happens in the evening. Anyway, back to my point! Friday evening and finally a weekend is upon us. My Missus' walks out and sits down in the other rocker and looks out in the yard. Im thinking she is fixin' to say how lovely the yard looks beings I just mowed and ran the weed-eater trying to stay a step ahead of the stuff(not Stuff'...) growing. NOPE! Right off she says, Do you remember just how long ago that dang duck season ended??? So do you?? Can you please tell me WHY I have to look out every evening and see those dang duck butts on the posts along with the camo netting hanging on the wall behind them??? WHY and WHEN will all of that stuff(again, Not Stuff'...) be out of my sight, WHEN! Talking about a "deer in the headlights" look. They are drying out so I can clean them up and store them proper like in the bags laying beside them. That way, I wont have to buy new ones for next year. She said right up, We been married for 48 years, so you maybe ought to try to come up with another excuse as I have heard that one several times. Plus, you always buy some kind of decoys every year. Then she says, Here's the deal.. you have them cleaned or whatever you are going to do with them by Sunday evening and out of my sight or I will moved them to the equipment shed myself! Guys, do ya'll really see a problem here??? Its just April so the season is barely over with! Well, I bowed up right off! Stood up and said all manly like, "Sweetie, I had planned on putting every thing up this weekend and thought about bush hogging the dove field if I have time! Would you like a glass of wine Sweetie?? Sometimes, the least little thing stirs them all up! Those decoys aint been in the way or hurting anything. I also kinda enjoyed seeing them there, kinda, sorta. riverrat47 and stevena198301 like this. Well Billy Bob, what can I say. You is a friend amoungst' all friends. Helping a brotha' by taking his stuff'(not ole Stuff'....) when he is in trouble with the Missus' is a true friend! Im just glad my new "left handed" over/under weren't no where close to be seen.. When it comes to wimmins there ain't no winning! I tried to explain to Miss Carolyn that hauling all of them decoys up to the garage attic was a dangerous task 'cause those steps are narrow and steep. And she sure would feel bad ifn I came tumblin' down and stove up my back. And besides, I'd just have to haul 'em back down come next season doublin' the chance of serious bodily injury. She didn't buy it and pretty much told me to shut my pie hole and just get it did. Well, Im honored to report that said decoys, camo netting, rusted from flood portable grill, bags, & misc. is still sitting right where it was Friday. I aint bragging mind you, just stating fact. Aint neither one of us said anything about them decoys & stuff(not Stuff'..) sitting out and I aint. I thought that Sunday would have been the day beings I was prompted to give that stinky dog a bath now and that the bath place was dang near right next to the decoys. AND, the Missus' even volunteered to help me with Maggs in the bath thing and she aint ever done that in 5 years. 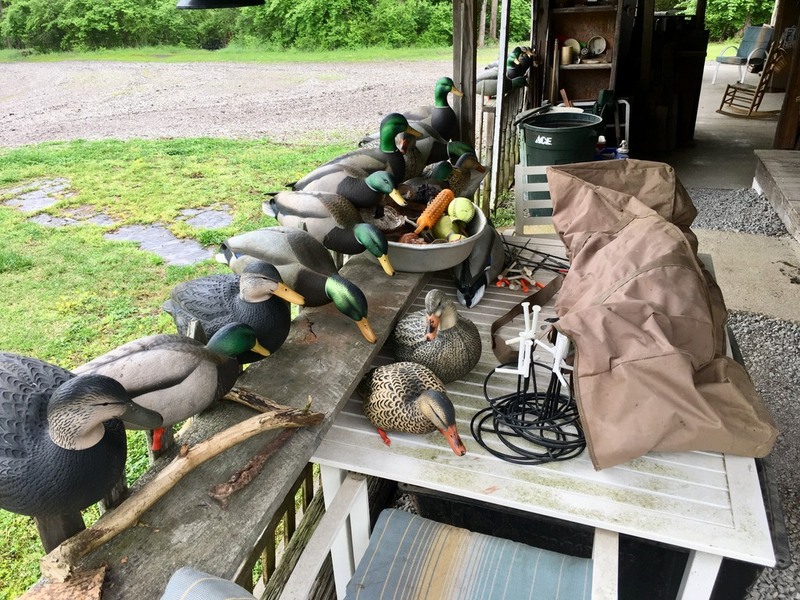 She even put the bottle of shampoo on the table with the decoys and nothing was said! I know, It was kinda scary, but still life went on. I aint for certain, but she just could have been blowin' smoke, but who knows.... Anyways, they are still there but Im thinking this afternoon, they maybe ought to be at least 1/2 sacked up just to show progress if nothing else. I was going to give them a good scrubbing but aint no need in doing it twice as I will do that in the fall to have something to do. We just have to pace ourselves in what we do. Doing nothing maybe aint good, but doing just a little something is a step in the right direction, at least thats how I see it. And, Im thinking I'll use just that statement when it comes up. Sometimes you got to put it in writing just so's you dont forget what you was going to say! Im sitting looking out the window and the rains are sure making the grass grow and the Dove field needs a good clipping before the Gly4 goes down..
Might wanna be keerful, she might have sumpin' up her sleeve. Just sayin'. yea, I gave that a little consideration but only a little. They are still there like they was. Kinda pushin the envelope a little, just because. I did some weed eatin today whilst' she was runnin errants figgurin on gettin a point or two. I did get the dove field clipped yesterday so I did something. I did go buy Tractor Supply and picked up 5 gallons of gly4 & a gallon of "kill everything for a year" stuff(not Stuff'...) gettin ready to fight a losing battle on weeds yet again. WHy one would ask? Cause that's just what I do for some reason. I headed out the back door to liberate ol Oz from the pen, pushed open the storm door an stepped on out. As the storm door is swingin shut I notice sumpin hangin off the top corner of it as it go by my face bout 6" away. I jumped bout 6 feet off the stoop an look back at ol mr poplar leaf who done dropped down onto the railin an bowed all up like they do this time o year. In bout 5 secs I were hackin him up wit a handy shovel. He won't but bout 16" long but I steppin mighty careful in an out the back door I tell ya. You reckon any of his brothers and sisters is hanging around just looking for a place?? At least you know for certain that there is one that wont be at the dinner table tonight!